The Presidential Early Career Award for Scientists and Engineers, established by President Clinton in 1996, is the highest honor bestowed by the United States Government on science and engineering professionals in the early stages of their independent research careers. Recipients are selected for their pursuit of innovative research at the frontiers of science and technology and for their commitment to community service as demonstrated through scientific leadership, public education, or community outreach. The awards embody the high priority placed by the government on maintaining the leadership position of the United States in science by producing outstanding scientists and engineers who will broadly advance science and the missions important to the participating agencies. The awards support the continued development of the awardees, foster innovative and far-reaching developments in science and technology, increase awareness of careers in science and engineering, give recognition to the scientific missions of participating agencies, enhance connections between fundamental research and national goals, and highlight the importance of science and technology for the nation's future. To be eligible for a Presidential Award, an individual must be a U.S. citizen, national or permanent resident. After receiving recommendations from participating federal agencies, the White House will confer the awards each year. Selection criteria and processes are dependent upon the agency. 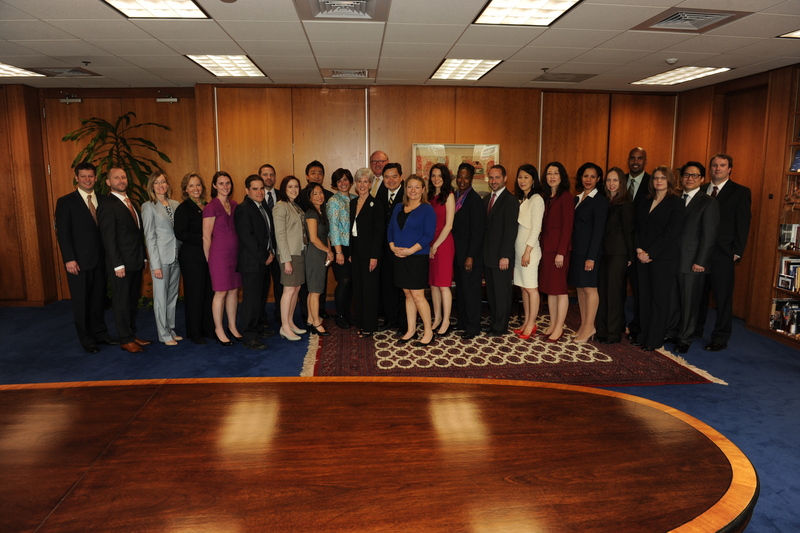 The 2012 PECASE recipients for the Department of Health and Human Services met with Secretary Sebelius on April 14, 2014. They were joined by Dr. James Anderson, Director of the Division of Program Coordination, Planning, and Strategic Initiatives at NIH and Dr. Joanne Cono, Director of the Office of Science Quality at CDC. 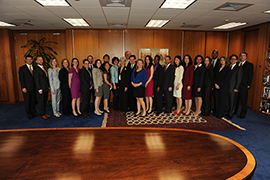 From left to right: Dr. Andrew Goodman, Dr. Jeremy Clark, Dr. Sandra McAllister, Dr. Katherine Rauen, Dr. Sallie Permar, Dr. Gaby Maimon, Dr. Todd Macfarlan, Dr. Susan Harbison, Dr. Shingo Kajimura, Dr. Quyen Nguyen, Dr. Joanne Cono, Secretary Kathleen Sebelius, Dr. James Anderson, Dr. Richard Ho, Dr. Jessica Gill, Dr. Katherine Radek, Dr. Ida Spruill, Dr. Aron Hall, Dr. Young Kim, Dr. Xue Han, Dr. Debra Auguste, Dr. Jessica Belser, Dr. Damien Fair, Dr. Andreaa Creanga, Dr. Andrew Yoo, and Dr. Thomas Fazzio.